CLEVELAND, Ohio -- In the opening minutes of "The Leisure Seeker," there was a Donald Trump speech blaring from a roving campaign car and a Carole King song from her mega-selling album of the 1970s, "Tapestry." My first thought was: That's two strikes. When Helen Mirren showed up a few minutes later in a bad brown wig, sporting a Southern accent, I thought: This is going to be long couple of hours. CLEVELAND, Ohio -- The much-traveled maxim assures us that "money can't buy happiness." OK, now for the flip side of that coin. If you want to see just how much unhappiness money can buy, invest some time in the dark and disturbing FX series "Trust," which premieres at 10 p.m. Sunday, March 25. 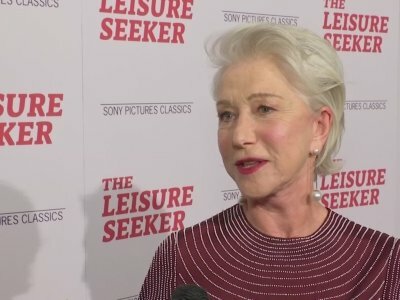 Helen Mirren and Donald Sutherland pack their bags and head off on a road trip to nowhere in "The Leisure Seeker," a misfired comedic-drama about the pains of growing old. Two very different families, one headed by an eccentric billionaire, the other struggling to make ends meet, come to TV this week via a thriller from an Oscar-winning director and a comedy revival that features one of the small screen’s most famous matriarchs. Is it possible to be completely riveted by an actor's performance, yet still want to see less of them? 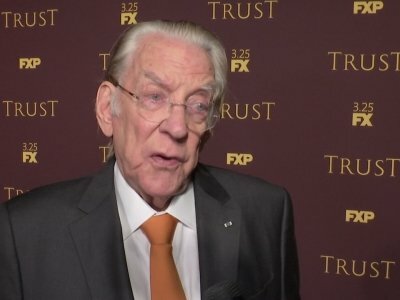 After seeing the first three episodes of FX's new drama, "Trust," I can tell you that yes, it is possible, as Donald Sutherland gives a tour de force performance, but his character is so incredibly creepy that the show actually improves when he's not onscreen. Yet, Sutherland's character is only one of the problems with FX's latest too over-the-top tale inspired by actual events. LOS ANGELES (AP) — Filmmaker Agnes Varda danced with Angelina Jolie. 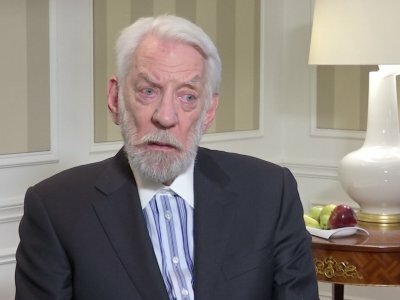 Donald Sutherland wanted to thank the characters he's played. Writer-director Charles Burnett said getting an Oscar eases the sting of a teacher's heartless words decades ago. Alejandro Gonzalez Inarritu dedicated his award to immigrants worldwide. And cinematographer Owen Roizman was moved to tears at the film academy's ninth annual Governors Awards. BEVERLY HILLS, Calif. (AP) — For every era of film in the last half-century, there's a memorable Donald Sutherland role. LOS ANGELES (AP) — Academy Awards and digital cameras eluded cinematographer Owen Roizman during his Hollywood career. But in retirement, he's found both. 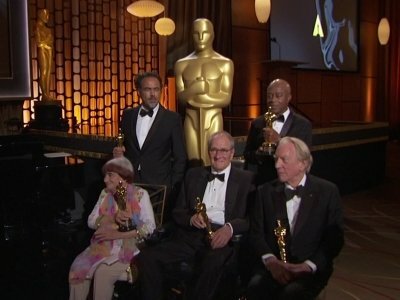 Roizman is among four recipients of honorary Oscar statuettes being celebrated Saturday at the film academy's ninth annual Governors Awards ceremony. "I never expected it," the 81-year-old said during a recent telephone interview from his Los Angeles-area home. "I thought all my accolades and awards were over with." 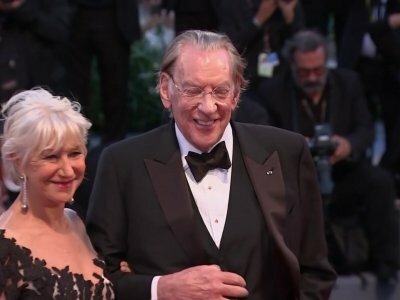 LOS ANGELES (AP) — Actor Donald Sutherland, writer-director Charles Burnett, cinematographer Owen Roizman and Belgian director Agnes Varda are getting honorary Oscars this year. The film academy said Wednesday that the four honorees will receive their Oscar statuettes at the ninth annual Governors Awards ceremony in November. Opening gross (inflation-adjusted): $129,828,300Total box office gross (inflation-adjusted): $360,025,800Starring: Jennifer Lawrence, Josh Hutcherson, Liam HemsworthFollowing her rescue from the devastating Quarter Quell, Katniss (Jennifer Lawrence) awakes in the complex beneath the supposedly destroyed District 13. Her home, District 12, has been reduced to rubble, and Peeta Mellark (Josh Hutcherson) is now the brainwashed captive of President Snow (Donald Sutherland). At the same time, Katniss also learns about a secret rebellion spreading throughout all of Panem -- a rebellion that will place her at the center of a plot to turn the tables on Snow. Opening gross (inflation-adjusted): $167,350,500Total box office gross (inflation-adjusted): $451,853,500Starring: Jennifer Lawrence, Josh Hutcherson, Liam HemsworthAfter arriving safely home from their unprecedented victory in the 74th Annual Hunger Games, Katniss Everdeen (Jennifer Lawrence) and Peeta Mellark (Josh Hutcherson) discover that they must do a quick turnaround and begin a Victors Tour. As she and Peeta travel throughout the districts, Katniss senses a rebellion is stirring. However, President Snow (Donald Sutherland) proves that he is still very much in control when word comes of a cruel change in the rules for the upcoming 75th Hunger Games. NASHVILLE, Tenn. (AP) — Kiefer Sutherland has one of the most recognizable voices on television and film whether he's playing agent Jack Bauer on "24" or the action hero Snake from the video game "Metal Gear Solid V."
But on his debut album, "Down in a Hole," which comes out Friday, Sutherland takes on a very different vocal role.